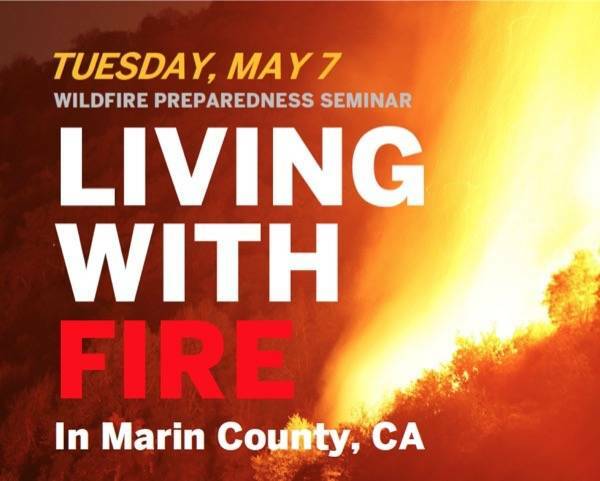 Join us for a FREE 2-hour seminar on wildfire preparedness for San Anselmo residents. Learn about your community’s hazard and what you can do about it from the wildfire experts at Ross Valley Fire Department, Marin County Fire Department, and FIRESafe MARIN. Monday, April 29 2019 from 6:00 PM – 8:00 PM, Ross Valley Fire Department will host this seminar, consisting of a 90-minute presentation and 30 minutes of questions and answers. Additional seminars will be held across Marin in 2019. Each “Living With Fire” session will focus on issues facing the community hosting the event. Parking may be limited – please carpool! Presentation: 6:00 PM - 7:30 PM; Q&A and meet with your Fire Department: 7:30 PM - 8:00 PM.